Last winter’s rains have set us up for a spactacular spring wildflower season this year. Though I’ve only been out to a few of Tucson’s favorite viewing spots so far, I’ve already seen some of the most beautiful displays I’ve seen in years. There should still be a month or so left in this year’s wildflower season, so I don’t plan to stop visiting our wildflower hotspots anytime soon. This blog post is a pictoral tour of what the season has had to offer us so far, but however proud I am of my little camera and my eye for a decent shot, these photos definitely pale in comparison to seeing the real thing in person. Get out there and see the wildflowers this year! You won’t regret it. OK, so this isn’t a wildflower, but catching this sunrise over Picacho Peak made my 4am start time worth it. I highly recommend starting early if you plan to hike (or climb) Picacho Peak’s Hunter Trail. California poppy (Eschscholzia californica) flowers stay closed until the sunshine finds them. The tiny flowers of desert indianwheat (Plantago ovata) look beautiful when backlit by the morning sun. Scorpionweed (Phacelia distans) can be seen blooming all around Tucson this time of year. The purple blooms are borne on spikes that curl like a scorpion’s tail. Arizona Jewelflower (Streptanthus carinatus) has one of the most unique flowers I’ve seen. It doesn’t look like much from a distance, but a close-up inspection reveals more intricate details. The tiny flowers of a rockmustard (Dryopetalon runcinatum) push up through a dense mat of greenery. Brittlebush (Encelia farinosa) is in bloom just about everywhere you look in Tucson. They’re truly beautiful when seen blooming en masse up the side of a mountain or hillside. This diminutive little plant is called Bladderpod Mustard (Lesquerella gordonii). It can be easy to miss when it’s growing along the ground beneath the showier flowers of spring. Desert chicory (Rafinesquia neomexicana) can be difficult to spot as well. It often grows within the stems and branches of nearby plants for support. The little flowers of the desert wishbone bush (Mirabilis laevis or bigelovii) open in the evening, and close by mid-morning. The first desert tobacco plant I’ve seen this season. This one was at the very top of Picacho Peak. Desert pincushion (Cheanactis stevioides) is abundant when the rains have been good, and nearly absent during drought years. This one is a butterfly favorite. Globe mallow (Sphaeralcea species) are a common sight in Tucson, but we most often see them with orange flowers. All of the Globe mallow that I encountered along the upper elevations of the Hunter Trail were this lovely pinkish hue. The more familiar orange globe mallow blooms could be seen near the beginning of the trail. One of the largest and most beautiful globe mallow shrubs I’ve ever seen is right off of the road near Picacho Peak’s entryway. Of course, there are california poppies (Eschscholzia californica) everywhere you look. …you can see here that they’re turning the mountainside yellow. Other roadsides in the park are graced with the purple hues of desert lupine (Lupinus sparsiflorus). 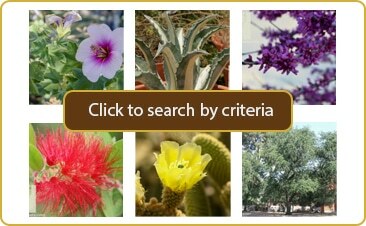 Tohono Chul has created some stunning wildflower displays around their cactus circle garden. Desert bluebells (Phacelia campanularia) bloom at the base of Mexican fencepost cactus. Western wallflower (Erysimum sapitatum) can be found blooming with the penstemon at Tohono Chul Park. Purple Owl’s Clover (Castilleja exserta) is more often seen at higher elevations, but I spotted one or two around the park. The wildflowers at Tohono Chul Park are so beautiful when mixed together and blooming in unison. Pathways lined with different species of penstemon in bloom attract humingbirds and butterflies.